For some people it is best to deliver news or information with a bit of sweetness, for others this is a waste of time and sometimes lacks a sense of efficiency. Sugar coating information can sometimes lead to certain aspects or details being left out entirely, and so for some this feels like it can lead to bad things. 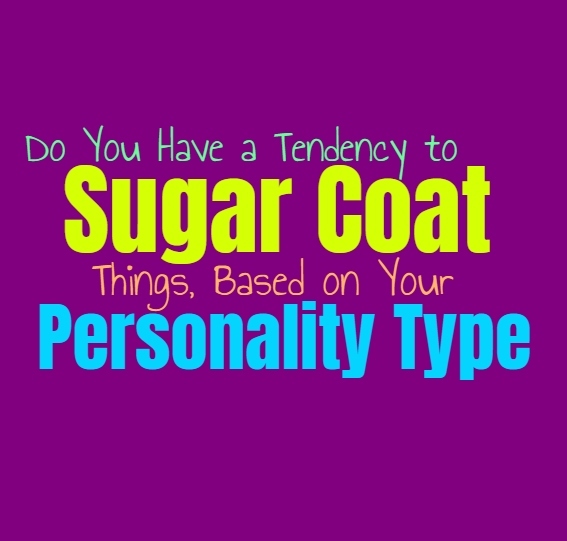 Here is how much you sugar coat things, based on your personality type. INFJs do sometimes sugar coat things, especially when they are worried about hurting someone deeply. It often depends on the specific situation, and just how important being direct and to the point is. If they feel they can get away with sugar coating the truth in order to spare someone pain, then this is often the road they will take. INFJs realize that sometimes being completely transparent is important though, and they will do their best to overcome their desire to please those closest to them. INFJs also have days where they might be feeling a bit more cynical and so they become less focused on sugar coating and become a bit more to the point. ENFJs definitely have a tendency to sugar coat things, since they want to spare the feelings of those they love. For the ENFJ it is important to always be supportive and compassionate to others. They really dislike seeing people in pain, and so they often feel the need to sugar coat things, especially could be harmful others. For ENFJs it isn’t about being insincere or afraid of being honest, since they still deliver the information as openly as they can. ENFJs just really despise seeing people suffer and if they can find a way to lessen the pain then they are going to opt for that choice. INFPs actually do sugar coat things when they see not reason to be crass or cruel. They see some people’s behavior of getting straight to the point, as an excuse to just be mean to others. At the same time INFPs believe in being upfront and honest, but they feel it is important to do this with a dash of sensitivity. Even if what they are expressing can be hard to swallow, they try to be caring and kind in the way they deliver this message. INFPs do have times when they avoid sugar coating entirely, but this is often when they are angry about something and feel it is important to express it clearly without sensitivity attached. ENFPs do believe in being honest and so sometimes they fail to sugar coat things. It isn’t done in order to upset anyone, they just speak their mind without always thinking it through. ENFPs want to be themselves around others and don’t like feeling as if they have to hold back or pretend. Their intention is not to be hurtful and they do care about sparing people’s feelings. There are times when they fully realize that sugar coating is necessary, and in these situations it comes naturally for them. While sometimes the ENFPs finds themselves speaking so openly that they don’t realize they aren’t sweetening things up as much as they might like. INTJs definitely don’t sugar coat things, instead they focus more on being direct and concise. They would rather not lose accuracy by having to sweeten things up for someone else. INTJs just aren’t naturally in tune with the emotions of others, instead they are more focused on information and being as sincere and accurate as possible. To the INTJ it shows more respect to be honest with someone than it does to try and sugar coat things to spare their feelings. To the INTJ this makes it seem like you don’t trust someone enough to give them the full truth. ENTJs are not fans of sugar coating information and rarely find themselves doing this. They are more likely to be direct and to the point with their delivery. ENTJs focus on facts and efficiency, and most of the time there is nothing efficient about sugar coating and wasting time having to soften things up to spare someone’s feelings. ENTJs can sometimes be seen as harsh because of this, but they simply intend to be honest and to the point. They are direct people who believe that sugar coating is just another form of lying to someone to avoid an uncomfortable situation. INTPs do care about upsetting people, but they don’t always recognize when they should sugar coat something. They are very direct people who focus on logic and facts. For them it can be challenging to really understand or read the emotions of others, and so they aren’t always aware of when they are being a bit harsh or too factual. INTPs want to be sensitive to others most of the time, but they find it easier to simply be honest and factual. INTPs favor accuracy and precision in their lives, which makes them much less likely to sugar coat. ENTPs are not naturally the type to sugar coat things, since they are more focused on being direct. ENTPs value honesty and don’t like feeling as if they have to hide things or hold back for the sake of someone’s feelings. They do care about their loved ones and don’t intend to hurt people, they simply value information and accuracy. ENTPs are very interested in being precise, and uncovering the truth behind certain information or situations. For them sugar coating can sometimes prevent them from seeing the truth, and so it isn’t something which happens for them most of the time. ISTJs don’t sugar coat things most of the time, since they prefer to be direct. They focus on being honest and clear, so that they can get things done as efficiently as possible. While ISTJs care deeply for their loved ones they express this by practical means, and aren’t very in touch with their emotions. They have a hard time realizing when they should be more sensitive with how they word things, and don’t intend to be harsh something. For the ISTJ it is just easy to be upfront and to express things accurately. ESTJs are very efficient people who believe in being direct and upfront about things. For them sugar coating is just another form of lying and often seems more selfish than it does considerate. They would much rather people be upfront and give them the information clearly and accurately. Sugar coating isn’t a sign of respect or consideration to the ESTJ, quite the opposite. They care about their loved ones and so they seek to be honest with them, even if sometimes this seems harsh. ISFJs do believe in sugar coating things, mostly because they don’t want to hurt others. They want to create a sense of harmony and comfort in their environment. They are compassionate people who simply want to make sure their loved ones are happy and cared for. They often recognize when something might come off too harsh or painful, and so they find a way to deliver this information with a bit of sweetness on top. ESFJs definitely sugar coat things, especially when they are communicating some difficult information. They really don’t want to hurt or upset anyone, and try their best to avoid this. ESFJs do have moments of tough love, but this comes from wanting to help their loved ones improve their situation. They strive to make others happy, and for them this is the most important goal. They will certainly sugar coat things if it feels like the right move, especially if being harsh just is not necessary. ISTPs aren’t really likely to sugar coat things, since they are upfront and honest people. They follow the facts of a situation and believe in always being as precise as possible. For them it is more valuable to give the information accurately, since this can actually help people learn and grow. For the ISTP being sensitive to the emotions of others does not come naturally and so sugar coating is just not something you will likely see from them. ESTPs don’t usually sugar coat things, especially when they are striving for accuracy. When it seems more valuable to be direct and precise, then they aren’t afraid of being a bit harsh in these situations. ESTPs certainly don’t want to hurt their loved ones but they don’t want to lie to them in order to make them feel better. They are supportive when they can be and will certainly sugar coat the less vital information in order to make them happy. ISFPs do sugar coat things, especially when they are trying to spare someone’s feelings. They want to be upfront and honest people, but that doesn’t mean they cannot be sensitive as well. They care about others and don’t like being unnecessarily harsh or cruel, since this isn’t something that comes naturally for them. ISFPs often see the beauty in others and do their best to share this knowledge with those around them. ESFPs do sometimes sugar coat information, especially when being too upfront can be harmful. They care about being kind and pleasing others, and so they try to avoid saying or doing anything which could upset them. ESFPs really care about their loved ones, and so they are capable of sugar coating information in order to make them happy. They would rather focus on positivity and believe in making each moment something special.